2/9/2017 If Exquisite Archangel is dealt lethal damage at the same time that you’re dealt damage that brings your life total to 0 or less, its effect applies and your life total becomes equal to your starting life total. 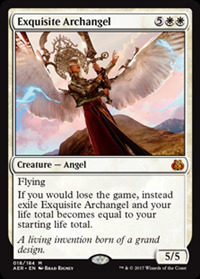 You choose whether Exquisite Archangel is moved to exile or to your graveyard. 2/9/2017 If an effect says that you can’t lose the game, Exquisite Archangel’s effect doesn’t apply. 2/9/2017 If you control two Exquisite Archangels, you choose which one’s effect applies. The other’s effect won’t be applicable after that until the next time you would lose the game. 2/9/2017 Exquisite Archangel’s effect applies any time you would lose the game, even if you’re not losing due to your life total being 0 or less. If you would have lost the game because you tried to draw from an empty library, you won’t lose again until you try to draw again and still can’t do so. 2/9/2017 Exquisite Archangel’s effect does nothing if you concede the game. A player who concedes leaves the game. 2/9/2017 For your life total to become your starting life total (normally 20), you gain or lose the appropriate amount of life. For example, if your life total is -4 when Exquisite Archangel’s ability applies, it will cause you to gain 24 life; alternatively, if your life total is 40 when it applies, it will cause you to lose 20 life. Other cards that interact with life gain or life loss will interact with this effect accordingly. 2/9/2017 If an effect states that an opponent wins the game, Exquisite Archangel’s ability doesn’t apply. 2/9/2017 In a Two-Headed Giant game, Exquisite Archangel’s ability causes the team’s life total to become the team’s starting life total (normally 30), but only you actually gain or lose life. Pair Exquisite Archangel up with Melira, Sylvok Outcast as long as you have a way to protect them through hexproof, shroud, and indestructibility. this effect resolves, and then you lose the game anyway. Seems to be a decent sideboard card in legacy reanimator. Storm hates this on the board, as do other fast damage combos like Belcher. This going into my reanimator Zur the Enchanter commander deck, that fetches for Necropotence. Draw 30 cards, "don't mind if I do". Oh i go back up to 40 life, fine by me. I'm putting this in a reanimation deck, then reanimating Phage.